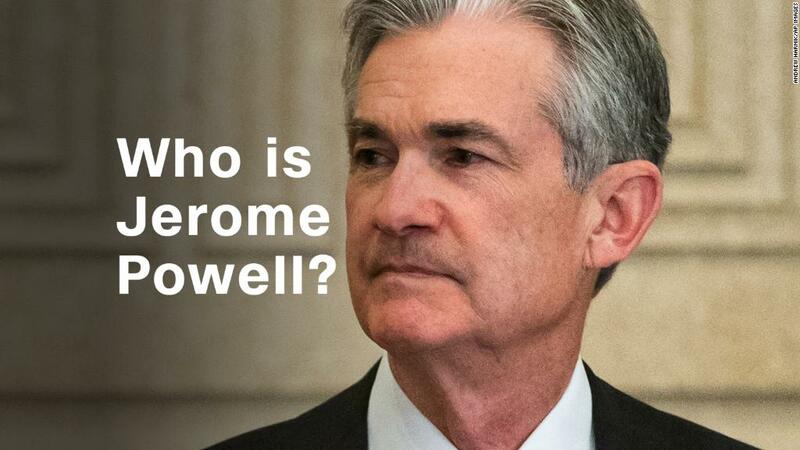 President Trump nominated Federal Reserve Governor Jerome Powell on Thursday to lead the world's most influential central bank. A Fed governor since 2012 and former Treasury official under the George H.W. Bush administration, Powell will replace current Fed Chair Janet Yellen. Yellen was nominated in 2013 by President Obama. Her term as the central bank's first female leader expires in February. "I am confident that with Jay as a wise steward of the Federal Reserve, it will have the leadership it needs in the years to come," Trump said during a White House press conference. It will be the first time in four decades that a new president hasn't asked the current Fed chair to stay on for a second term. Powell was among five candidates considered for the job. Also on the president's short list: former Fed governor Kevin Warsh, Stanford University economist John Taylor, the president's top economic adviser, Gary Cohn and Yellen. Although news of Powell's nomination was expected, stocks ticked higher on the announcement and the Dow hit a record high. Trump made his announcement in the Rose Garden at the White House, calling on the Senate to swiftly confirm him for the role. "There are few more important positions than this, believe me, in our government," said Trump, who described Powell as "committed " and "smart." Powell said he was "honored and humbled" by the president's nomination. As the next Fed chair, he promised to keep the longstanding tradition of making objective decisions based on the best available data. The president also thanked Yellen for a "terrific job" leading the U.S. central bank. "We are grateful for her total commitment to public service," Trump said. In a statement, Yellen congratulated her colleague and said she was "committed to working with him to ensure a smooth transition." Ahead of Trump's formal announcement Thursday, Cohn had praised the president's choice. "I'm really supportive of the president's decision -- and it's a great decision," he said speaking before The Economic Club of Washington. A senior administration official told reporters that Trump wanted to appoint the "best person to this position" and that he "very much respected" and "found appealing" Powell's previous industry experience. "He has to be very comfortable with the chairman of the Fed as events and economic developments (occur). He has to have somebody he trusts to make the right judgment calls," said the senior administration official. The position of Fed chair requires Senate confirmation. Republicans currently hold the majority and would be able to confirm Powell without any Democratic support, if necessary. At 64, Powell has been Yellen's ally on monetary policy, while also calling for easing some of the regulations on banks put in place after the 2008 financial crisis. Unlike almost all of his predecessors in the position, Powell is not an economist by training. Instead, he was a lawyer and former partner at private-equity firm, Carlyle Group. Two immediate challenges face Powell once he is confirmed in the role: How quickly to raise interest rates and how to continue to safely unwind the Fed's hefty balance sheet. It's the job of central bankers to shift policy levers, nudging interest rates higher or lower, to boost jobs and keep prices, or inflation, at the optimal level. What's made their job trickier is that inflation is signaling the Fed should not increase rates. But economic growth and a low unemployment rate of 4.2% are saying it should. Powell has been supportive of Yellen's plan to gradually raise interest rates, if there are continued signs of improvement in the economy. "The economy is as close to our assigned goals as it has been for many years," said Powell in a June speech at the Economic Club of New York. "Risks to the forecast now seem more balanced than they have been for a some time." Given Powell's role in helping to shape the Fed's current policies over the last five years, analysts said they don't expect the central bank to deviate greatly from its current path. "We expect the monetary policy reaction function to be little changed on several fronts," Michael Gapen, an analyst with Barclays Research, wrote in a note to clients. Powell will also have to oversee how the central bank continues to shed some of the $4.5 trillion in investments it made in order to prop up the economy after the financial crisis. The Fed began the process of unwinding almost a decade's worth of stimulus investments in September. For years, the central bank piled up purchases of Treasury and mortgage-backed securities, a strategy intended to stimulate the economy by reducing borrowing costs for everyone. At the time, it also reduced its benchmark interest rate to zero, and only began raising it in December 2015, seven years after the crisis. Powell voted in favor of winding down the Fed's balance sheet. And like Yellen, he's left the door open for a new round of asset purchases in the event of another crisis. In April, the Fed tapped Powell to serve as the new point man overseeing how Wall Street banks are regulated after Daniel Tarullo, the central bank's regulatory czar stepped down. Tarullo held the position for the past eight years. In this role, the Fed governor has sided with the Trump administration on easing some of the regulatory burdens on banks. He's specifically suggested relaxing the so-called Volcker Rule, which bars banks from taking risky bets with taxpayer money. The heads of several top banking lobbying organizations lauded the decision by Trump to choose Powell for the role. Kenneth Bentsen, the President and CEO SIFMA, which represents the securities industries, commended Powell as someone who would "give markets and investors great confidence" and would provide a "steady hand." "He has demonstrated sound judgment in his handling of monetary policy since joining the Federal Reserve," said Rob Nichols, president of the American Bankers Association, in a statement. Key lawmakers on Capitol Hill said they welcomed the opportunity to speak further with Powell on his plans to guide the U.S. central bank at such a critical juncture. Senate Banking Committee Chairman Mike Crapo said he was keen to hear how Powell intended to "strike a proper balance" between a safe financial system and one that wouldn't stifle economic growth. His Democratic counterpart, Sen. Sherrod Brown, said he hoped Powell wouldn't have the "same amnesia that plagues the rest of the administration" when it comes to the Fed's role in shaping post-crisis rules on Wall Street banks.